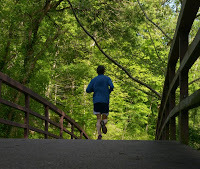 I went for a longish run in Rock Creek Park this evening—trying not to let the heat keep me from it, as I too often let the cold keep me inside this past winter. Tonight's route was the same one I ran when I first moved into the city from the suburbs. Midsummer into fall of 1995, I ran almost every night, through 90- and 95-degree temperatures, stopping at the exercise stations along the trail to do sit-ups and push-ups, even an attempt at a pull-up or two. It was one of the fittest periods of my life. I was so happy and proud of having made this move, finally at age 33—felt so lucky to have found an apartment in a grand old-fashioned 1920s building with hardwood floors, built-in china cabinets, stucco walls, an arched entryway, even a Rear Window alley view. In mid-October of that year, I met (or rather remet; he was a former student of mine) the guy who would become my partner for the next eight years. While I continued running—as I had before and have since—I think of those three months when I was on my own in the city for the first time as a precious period in which I was fully myself—myself becoming, for sure, but myself. I lived in that building for two years, then moved in with the guy. If I hadn't been so excited about what was to come, it would have been wrenching to leave what in some ways I still think of as my perfect apartment. Anyone who reads this blog knows that I love where I live now—the home I own—and the man I'm with now. So much changes over the years without our having to do anything to make it happen. We just adapt. And sometimes embrace. An old home can still be allowed to be perfect in memory. As I was running tonight, I realized that not only was I on a familiar path on a familiar kind of summer night, but it was exactly 18 years ago to the day that I moved into DC, and into that apartment. July 15, 1995. Perhaps tonight is the beginning of another run—shirtless or not—that I can't even see the shape of yet. I have no way of knowing. For my dog P. and me, the last couple of weeks have been an odyssey of symptoms, vet appointments, emergency-room visits, and long-distance communication with her other dad, with whom I've shared custody of her for the last decade (we broke up exactly ten years ago this month) and who has been traveling in the Far East for the last 16 days. Long story, but what initially looked like kidney failure has transmogrified into a likely slipped disk in P.'s neck that is probably treatable with rest and "heavy duty" pain medication. Her kidney values, the cause of so much initial alarm, have "resolved." She's spending her second night in the hospital tonight to get her fever under control, but I have high hopes she'll come home tomorrow. Mysteries remain (why the apparent incontinence episodes? why the fever? how could we not have noticed a neck injury? ), but the situation now seems manageable and not so dire. 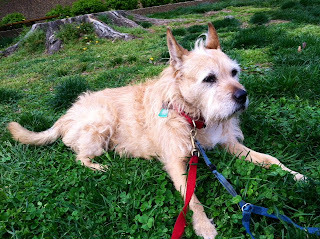 As I send S. lengthy e-mails with the details of each communication with a doctor (several have been involved, as her regular vet practice is also a 24-hour hospital), I admit there's satisfaction, even enjoyment, in feeling so . . . competent. Part of my sensation of being in control has to do with my ex being 10,000 miles away—a situation that I know is not fun for him, as he is deeply attached to P. There has been little disagreement, no phone calls with the two of us talking over each other or being self-consciously cordial. He has thanked me more than once for taking care of things, and I have acknowledged how hard it is for him to be so far away when P. is ill. But I'm also aware, or became so this evening, that—at this particular time—it probably feels fulfilling for me on some level to be a caretaker again. What I mean is that I'm realizing what may be going on: that is, I've missed feeling that someone relies on me in such a vulnerable way. I've always cared about—and for—P. ; doing so now is nothing new. But she is "old-old" (15 or 16), and this stage of her life, particularly this recent crisis, has a familiarity to it—not only because of this week's anniversary but because of other animals in my life I've helped see through to the end. My relation to P. has undeniably deepened in the last few weeks—I feel her preciousness more acutely. For now—rather, when she returns home—there is this: taking in the breezes, together, on a warm, green day. Today is the official anniversary of my father's death, at least according to the doctor's declaration in the early morning hours of July 7, 2012. But the day before was when I sat by Dad's bedside with my brother and D. for 13 hours and said a final goodbye just as the clock's hand approached midnight. So yesterday was the day I visited his "niche" in the columbarium at Arlington National Cemetery. It was only the third time I'd been there since his inurnment in September. 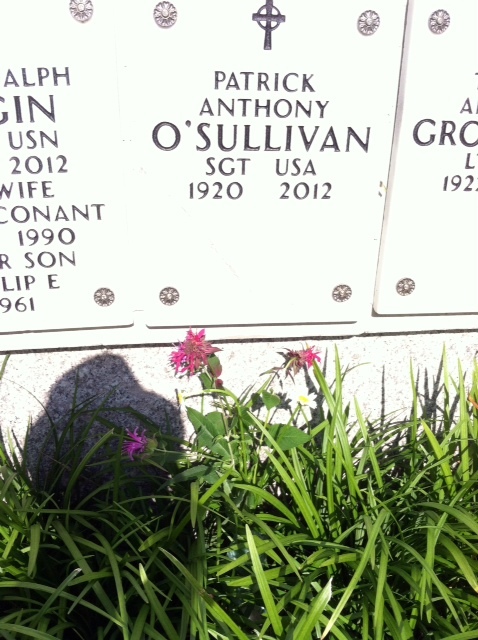 I went there with my sister and brother-in-law on Christmas Eve (amazed to see every single grave in the cemetery decorated with a wreath); the three of us returned on Father's Day last month with D., the first time we saw his name plate in place (it had taken some months to complete). Yesterday I went alone, sitting across from him in the shade of a blazing late afternoon. My father's name carries such power for me—almost like seeing his face, the letters forming a physical embodiment of who he was: the first name he was given, the middle name he chose (it was his confirmation name; he didn't have a middle name), the last name that resounds with the Irish ancestry he was so proud of. Shortly before leaving, I used the "spin" function on the Poetry Foundation's app to find something to honor of the poetry lover Dad was. I didn't read it aloud but silently to myself, and to him. And thou shalt give me youth. And thou shalt give me strength. And thou shalt give me speed. For thee to give me heart. And thou shalt teach me love. About a month ago, I went to my 30th college reunion. The 15th was the first college reunion I'd ever gone to. That year, 1998, I checked with friends, but no one was able to to make it. Yet something I couldn't put my finger on kept compelling me. So at the last minute, without really knowing why, I rented a car and drove up for the day. I spent a lot of time wandering around campus by myself, revisiting the person I used to be—visiting the duck pond; my freshman dorm; the dining center where I trekked daily to retrieve my mail (an important ritual) and hung out with my friends over meals; the buildings where my German classes, my deepest engagement with language, took place. At that 15th reunion, I had a long, memorable conversation over dinner with a guy I had only vaguely known in college; he was also gay (out of the closet back then, unlike me, but not particularly happily), and we shared experiences about that: wondering glances across seminar tables, envy and sometimes fear of the outrageously fearless. All in all, I had a great time at the 15th and was glad I went. I learned to listen to that inner voice, sometimes more extroverted than I am, that wants me to go to places I'm uncertain about. The next reunion, the 20th, I made sure well in advance that my friends would be there, so that one was all about being together, reconnecting in a familiar setting. The 25th was similar. This year, only two of my friends, out of about six or so, were able to make it, so the reunion felt a little less "fun." But it had its moments. For instance, finding the tree, a sweetgum, dedicated to our friend Mark, who died of AIDS 17 years ago, and showing it to J., who went to high school with Mark as well as college but hadn't seen the tree before. I told J. about the last time I saw Mark, when he was very sick and living at his parents' house; after his mother came onto the deck where we were sitting, Mark said simply, "She's a saint." When I told J. that story, he teared up; I felt bad, but then I realized it was okay. He and Mark shared a long history together, but they weren't in close touch at the time of Mark's death; J., who was living in California or Texas when Mark died, couldn't make it to the funeral. Maybe I was able to give him a small moment of Mark that he hadn't been privy to. 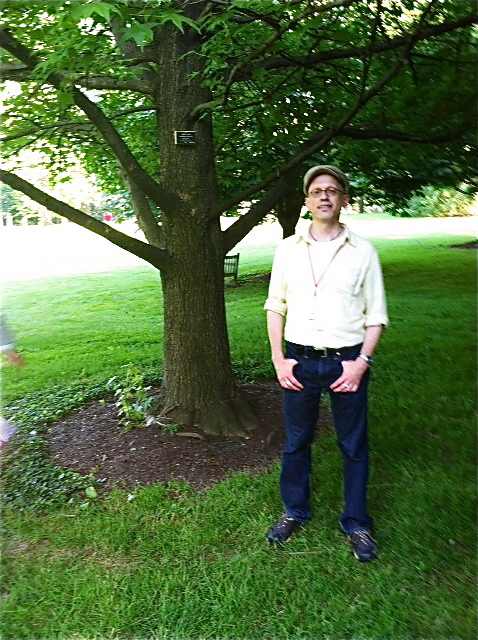 I also was moved to speak about Mark at a Quaker-meeting-style memorial my class had for fellow '83ers who had died. (This was a first; I guess we're officially in that demographic now!) I said that Mark and our friend K.—through whom I met Mark my freshman year—were my "way into" Haverford. I was miserable my first couple of months of college, and it was their openness, humor, and determination to draw me out that gave me permission to take my place there. I also recalled the last time I saw Mark, on his parents' deck, physically so altered by his illness, and said it was a lesson, as clichéd as it might be, that we are not our physical selves. The main thing that stood out about my 30th reunion was a nighttime solo walk around campus that I took after saying goodnight to my friends J. and C., who were going on to an event I wasn't interested in. Walking around—seeing all the unfamiliar buildings, the confident and ridiculously young students helping out over reunion weekend—I realized: Haverford is doing just fine without me. And I'm doing fine without it. It wasn't at all a dismissive feeling. Just an acknowledgment that I don't need to keep burrowing back. The path is already there, worn into the ground. And it leads in the other direction as well, back toward home.